Hi. I have exercised since my mid 30's. I am 148 pounds and 5 foot 2 1/2. Started out as 5 foot 4. I am not toned the way I would like to be but am in pretty good shape. I have used an elliptical machine and free weights for last few years. Main problem: since 55, I have repeated injuries that stop me from making true progress. Low back pain started at 55. Son a PT and gave me exercises to do, which always kept me stable. But if I let up at all pain returned. I got bursitis in my hip for a year from an exercise routine. Hurt my right shoulder doing a weight lift incorrectly. I recently hurt my ankle jumping on neighbor's trampoline. That led to two weeks limping and no exercise for a month. When I returned to exercise my whole back hurt. Started taking 800 mg ibuprofen twice daily. Back pain intense at work. FINALLY sought help of chiropractor and doing great now. Have had 6 visits. She determined that the ankle injury exasperated my back which already had sacroiliac issues. I have a scoliosis that I thought was giving me arthritis in my low back. But it's my SI Joint. Anyway she is fixing me and I have been able to faithfully do a 35-minute stretch routine that I believe has many yoga moves in it. The chiropractor is slowly releasing me to do core exercises. Soon I will be on my own again. She approved yoga and Pilates. I just don't want to hurt myself again. So I have been researching like crazy and FOUND YOU. I'm excited because you seem to specialize with my age group and specific issues. So I'll slowly be adding your DVDs to my library. Gonna get the one on backs first and move on accordingly. I was excited to see you have the exercise ball. Had one for two years and don't use it. So, I believe it's a God send that I found you and will be devouring your web site until I get the OK from my chiropractor to go ahead and order the DVDs. Thank you for being there. Also any advice on the order of purchasing your DVDs as far as beginner to working forward would be appreciated. Hello Joanie and thank you for sharing your story. 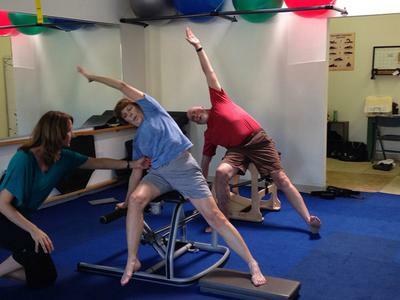 For myself and many others who I work with, the aging process is much more pain-free and graceful with Pilates exercises. The low impact exercises are much more gentle on joints and don't seem to "hurt" as much as traditional weight routines. I have over 40 videos on my site and you-tube channel under "Jennifer Adolfs" that are Pilates exercises tailored to a variety of joint issues and some for those who are apparently healthy. The Healthy Back and Joints DVD can be purchased from this page:Beginner Pilates DVD.